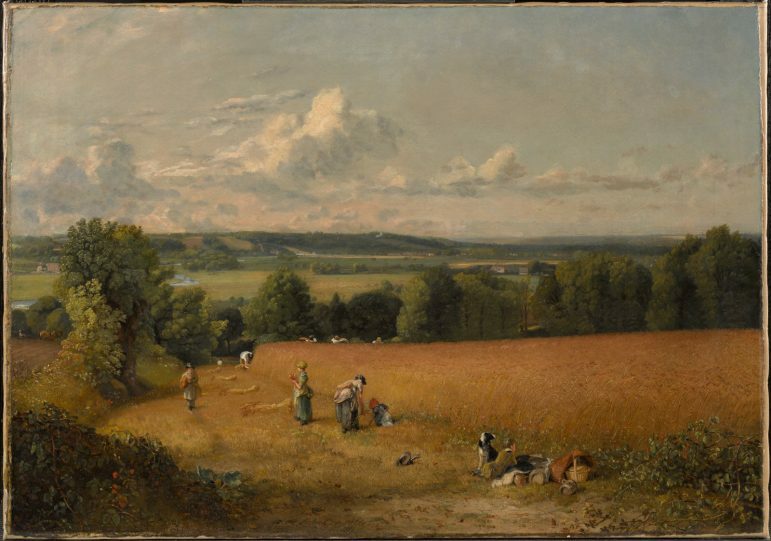 John Constable’s The Wheat Field (1816) depicts an August harvest in the English county of Suffolk. Photo courtesy of The Clark. English painters Joseph Mallord William Turner (1775-1851) and John Constable (1776-1837) contributed substantially to the elevation of the landscape genre in the 19th- century art world. The new Clark exhibition Turner and Constable: The Inhabited Landscape pairs the works of these artists, illuminating their portrayals of figures and man-made structures within the natural landscapes. The majority of the works come from the Manton Collection of British Art, which the Manton Foundation gifted to the Clark in 2007. Alexis Goodin M.A. ’98, the Clark’s curatorial research associate, organized the exhibition and described its importance. “[Turner and Constable] is an opportunity to celebrate [the Manton Foundation’s] gift, and to show how works from the Manton Collection complement works that our founders, Sterling and Francine Clark, acquired,” Goodin said. Didactic texts in the exhibition further illustrate that Turner’s and Constable’s placements of human figures in landscapes are more than simple staffage. Not just mere accessories to the landscape that demonstrate scale, the human figures depict the individual’s response and relationship to nature. By focusing on human representations within these landscapes, viewers are encouraged to consider the artists’ positions on the practical and abstract concerns facing England at the time, including industrialization and changes in class structure. The exhibition is sectioned into four rooms, each considering a different aspect of the artists’ landscapes. In some, such as a room displaying portrayals of laborers, Turner and Constable are equally represented as both were aware of and interested in evolving labor practices in England. Other rooms contain more works by one artist than the other, revealing sharply contrasting styles, both in technique and subject preference. Turner is regularly described as having been inspired by nature’s most dramatic and exceptional spectacles. Figures within his compositions sometimes appear helpless or insignificant within a larger expanse of landscape and, accordingly magnify the grandeur of the landscape itself. In Turner’s later, more abstract works, figures and forms are barely distinguishable, obscured by profusions of light and ocean spray. Constable, on the other hand, is characterized by a preference for peaceful, familiar scenes. Many of his paintings portray personally significant locations, such as Osmington, the village where he spent his honeymoon. Constable’s style remains more measured and conventional than Turner’s, and the composition and subject matter of his paintings often reflect his advocacy for traditional social and economic structures. In conjunction with the exhibition, Images Cinema is presenting three films as part of a series entitled “The View from Here,” which explores the landscape in cinema. Terrence Malick’s Days of Heaven (1978), screened last Saturday, focuses on seasonal workers who travel to the Texas Panhandle to harvest wheat for a wealthy farmer. As tensions build and secrets are slowly uncovered, the idyllic landscape erupts into catastrophe. Olivier Meslay, Hardymon director of the Clark, introduced the film and discussed its relationship to Turner and Constable. “I think it would be difficult to find a film more in tune with the images and ideas of the exhibition at the Clark, for it is a film that is as occupied with the land as it is with the people,” mused Meslay, a Malick enthusiast. He went on to discuss specific parallels between the film and each artist. He suggested that Malick’s visual style was similar to Turner’s as they both used “techniques that rendered the world much more brilliant and sublime than perhaps it is.” This is a reference to the film’s famous cinematography, credited to Nestor Almendros and Haskell Wexler. Most of the scenes take place during the “golden hour,” a period when the sun is near or just below the horizon, giving the film an impressionistic quality. Williamstown contains an abundance of art within a relatively rural landscape; this unique combination allows for special opportunities to consider the themes and motifs of this exhibition. Moving beyond theoretical consideration, residents and visitors can physically immerse themselves in the exploration of the relationships between human and landscape, landscape and art.